One of the challenges for 3D Printing is allowing younger students sometimes access to and use of the machines. Our School has targeted this group of students with a Junior STEM program, with the intention of giving the students access to 3D Printing in the Classroom. The initial design for this project, created by the School Principal, Heath Chittenden, was students creating a book mark suitable for reading. Students were given a Tinkercad logon which they used to refine their design on the basis of circles - they picked up the process quickly. Extension for the students came from a student who created a ring. Learning Challenge: To design and create a 3D Printed Bookmark suitable for use with a book. Students to use a basic design (featuring the circles) and then added their individual touches. Background: Using the 3D Printers with students in the Junior School. Junior School in New Zealand equates to students between the ages of 5 and 9 years old, although this class were 8 and 9 year old children. Lessons took place for an hour once a week. Task: Students had to design, manufacture and make a working bookmark. Level of Difficulty: Low - a template was used for the basic design for the students. Issues: student originally had some feet an antenna that while they added some detail to the creature tended to be flimsy and easily broke off or had to be removed after the final print. As an added detail the filament used to print the bookmarks was glow-in-the-dark filament. Timeframe: 3-4 hours on basic print settings. Process: Template designed in Tinkercad, shared with students. Students then edited the design, and added additional features. Converted to Cura and printed on the Schools Ultimaker 2 3D Printer. Our second group of senior students from Auroa Primary School are just completing their 3D Speaker Build Project. As detailed previously on this site the students here at Auroa Primary School have a series of technology lessons that run from 9am to 2pm on Fridays as part of the technology program. In New Zealand its typical for students to travel to a School that offers Technology for most schools with small Y7/8 roles its usually a local Intermediate or High School. (Y7/8 is students who are 11 and 12 years old). Previously the Auroa Primary School students had attended the local High School. For the first time in 2014 the School provided students with an internal Technology program, as also previously detailed on this site. Students rotate around technology groups for five weeks. Students who first attend Woodwork spend the time making the wooden boxes that will house the speakers. The speakers themselves are part of a kit set supplied by a New Zealand Technology Company, Mindkits. The students make the boxes and then spray paint them. When they go into the 3D Printing portion of the Technology Cycle the students are able to design handles, the speaker covers themselves and the feet of the speakers and 3D Print them. There has been a shift towards more individualised speakers 3D Printed in the second cycle. Students have started personalising the 3D Printer Covers and adding details like their initials into the covers. In the first cycle the students designs were very much modelled on the traditional speakers that would come with a regular stereo system. The print time varies per speaker cover, however on Fast Print settings print times would be in the region of 20-24 hours (each). Nearly every design has featured two covers so of course that would be 40-48 hours in total. 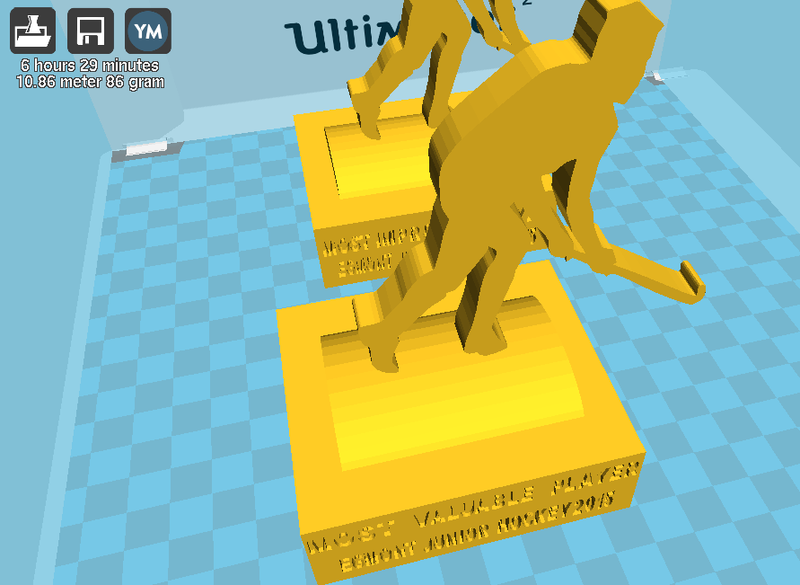 For the feet and handles they are being placed onto one Tinkercad Print page and all printed at the same time. For a collective print that looks at printing all six (four feet and two handles on Fast Print settings) we are looking at a print time of again, approximately 20-24 hours, with again some variation coming as a result of the individual student design. This video produced for Auroa Primary School describes the Schools' DPE (Technology) Program. It details the teaching process in the four key areas of DPE (Technology) for the students, 3D Printing being one of these. It is a detailed description from the teaching staff and students of the program and how it is taught. Additional details have been hyperlinked. Auroa Primary School for 2015 created a modern program for Technology for students - a series of lessons were created for Robotics, E-Textiles, Woodwork and 3D Printing. The School website has details of the program that the students are involved in, with examples of each. Each of the students have had the opportunity to work on Friday from 9am to 2:00pm for five week blocks. The final activity for the students was a free design activity allowing students to create an original piece of 3D Printing Work. The project was designed following a creation process by the students, a creation of the project using Tinkercad and then a trial and creation of a Prototype. In the link above you can see examples of some of the original work and ideas created by the students. Students managed the entire process themselves - in this example on this page the student concerned had an interest in Golf. 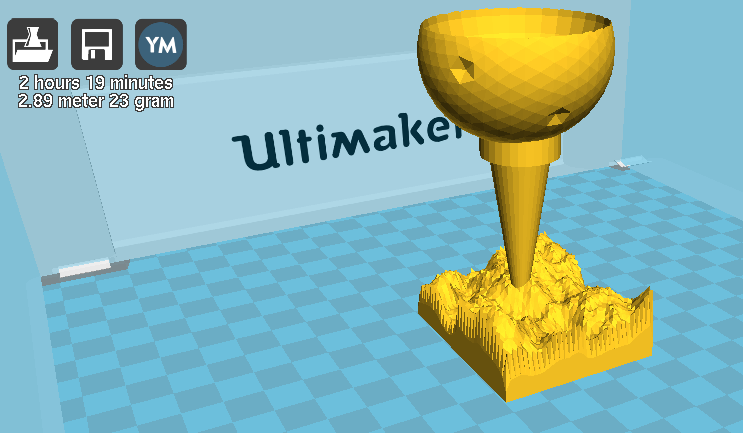 The student created a model of an Egg Cup with a Golf Theme, created the model digitally using Tinkercad and then created a draft print. The original print was not successful as the cup was not balanced enough to hold a regular hard boiled egg. The student redesigned the cup portion of the cup ensuring the base was larger and was then able to complete a successful print. The original print was a draft setting. The detail was added to include the indentation the grass design on the base and the Tee/Cup design. The student was able to complete this on the second print. The time allocation of print was eight hours on the 'Fast Print Setting'. 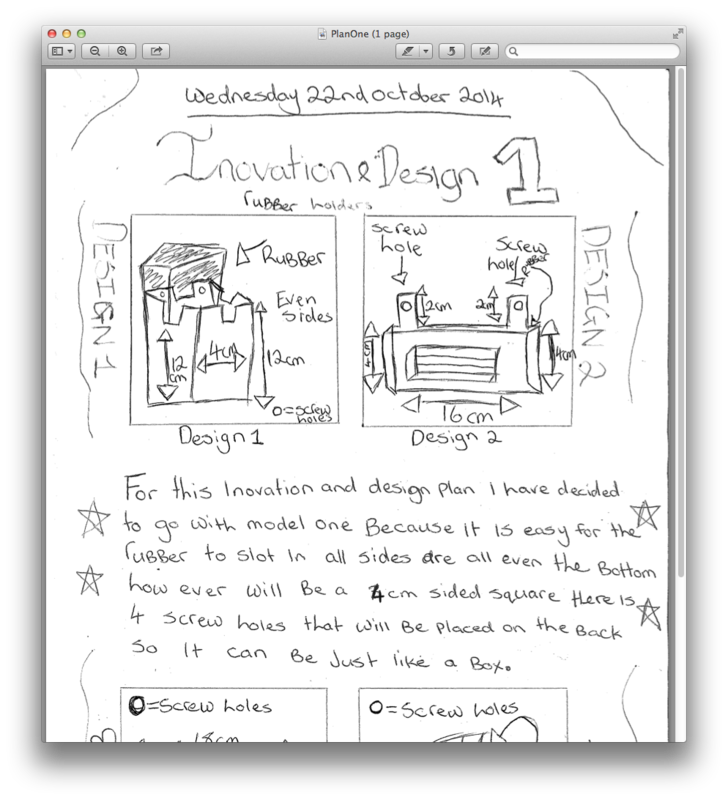 Learning Challenge: As part of the student projects for Technology for Y7/Y8 students at Auroa Primary School in New Zealand students had a design option for the final block of time in class. Students had to plan, create manufacture a free design option - the student in this case choose to create a Kitchen Utility Holder, however the dimensions of the object, which were approximately 30cm cubed meant this was the single biggest print to date. Background: Auroa Primary School has put online its digital learning for the use of 3D Printers. You can view that by clicking on the link here. As mentioned above this design came in the final part of the 3D Print Design Process, however it was significant that this was the largest single print attempted thus far. Task: A free design task for students, however it was not an 'open' task as students had to design, create and follow a process. Level of Difficulty: Moderate - the design was the creation of the students. In this case the name of the student was cut into the design. Issues: The inserts into some of the utility holder were vertical, this meant that the primary one worked well, however the angle on the other ones should have been tested with various kitchen items to ensure that they would work with a variety of items. Wooden spoons for instance would sit well in the main well, however the angle of the outside holders had meant that would not work. Timeframe: This print took 39 hours to complete on a regular setting. It wasn't clear prior to the print whether or not it would be achievable. Given the time that was projected being so long the concern was that the print would not smoothly print at some point early in the piece preventing the print from completing. As it turned out this was unfounded. It printed perfectly. Size: the completed project was 30cm wide, 30cm long and 25cm high. The print used 58m of filament. Process: Paper design, converted and created in Tinkercad. Converted from Tinkercad into Cura and then downloaded for 3D Printing. The student had not apparently intended the design to be as big as it was. Further Reading: Auroa Primary School's Technology Program is now available online. It includes the entire teaching process, details about student projects and examples. Background: One student in class sister had a medical condition which limits her motor skills, cerebral palsy. As a result she had trouble operating her iPad because she couldn't tilt it when it was lying flat on the desk in front of her. Her brother thought that the 3D Printer would be ideal in designing and making a tilt to allow her to use her iPad with easier access. Task: Help someone with difficulty by 3D Printing. Level of Difficulty: In this case the student came up with the idea, concept and all other aspects of the production. His sisters condition allowed him to identify the need and he was successful with the second print of achieving what he wanted. Low. Issues: The tilt was constructed with a specific iPad cover in mind. A potential extension was to further develop a clip however as the first run was so successful this was not required. If his sister had a different cover for her iPad then the task would have been considerably more difficult. Details: Completed by a Y8 (12 year old student). The print was successful on the first attempt. The design on Tinkercad was able to be produced in under five minutes. Timeframe: Forty minute print time. Problem Solving: As mentioned the iPad case and the design of the tilt complimented each other a obvious further extension was that the student design and create an original stand for use with the tilt. Labels: Auroa Primary School, Making Life Better, MM2015, Ultimaker 2. Learning Challenge: Students design a badge for the classroom. Background: Searching for a task to tie in with a introduction to the classroom and basic design. We discussed a 'badge' idea as a building task and it was completed literally by a student. Task: Design a badge for the classroom that was unique. Level of Difficulty: Low/Moderate - the student concerned created this model on his second attempt working with Tinkercad. The original design came in with a 28 hour print time and the refined version, shown above, was much more stripped back - duration was an hour. Issues: The design had the letters linked, in the first version the letters weren't linked but were backed on a stand. This design besides reducing the build time considerably also ended up looking better as a result. Details: Completed by a Y5 student with his second ever build. He was able to manipulate the design process with Tinkercad easily and produce something straightforward but also extremely effective. Size: Length of 10cm, width of 6cm and a depth of 5 mm. Problem Solving: The students original design idea on paper proved somewhat difficult to translate directly to Tinkercad as he had to incorporate a local landmark that was difficult to replicated. This caused him to concentrate on the lettering, which while striking was not the focus of the original design. One unexpected bonus was the size of the print made it an ideal badge size - something the student is keen to focus on, with a current idea of backing the badge with a pin to allow it to be worn. As an extension activity the student is going to design a visitors badge for all visitors for the school to wear and look at producing a set for the office. 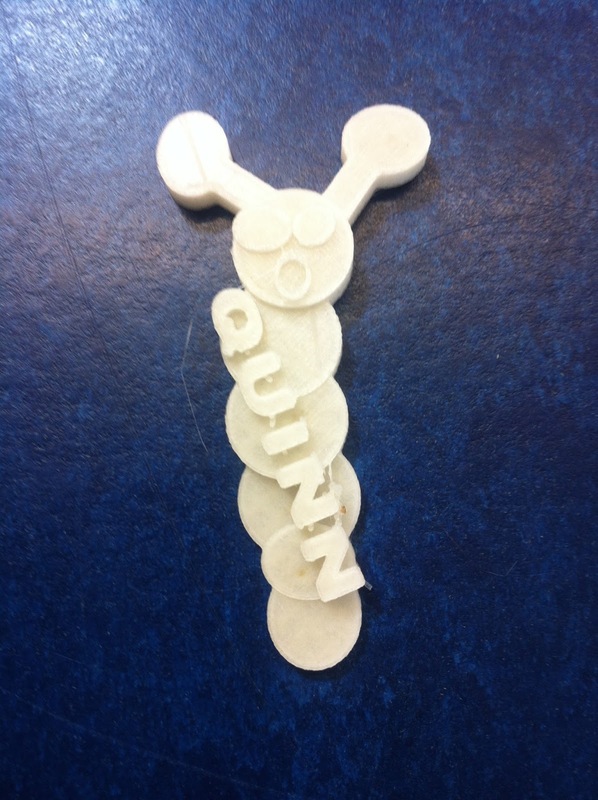 This is a sample of a student from Auroa Primary Schools Full 3D Printing Digital Portfolio. For the school wide reward program for Innovation and Design the students were required to complete five projects (this student completed four in the allocated time, was unable to complete the Key Holder due to faulty design that would not print). Each design was completed on paper, converted to Tinkercad and then a test run was completed. A second print run was then made on the basis of the success or otherwise of the print. The included screen shots an scans are work from a Y8/12 Year old student. Learning Challenge: Create a holder for a whiteboard duster and white board markers for practical and effective use in the classroom. Background: As part of the students goals for the year the students have a booklet to complete specific tasks for school wide honours, in this case called the Keys Program. As part of this and wanting to encourage the use of design and creation of work involving 3D printers and practical engineering tasks. This task was created and designed by the Auroa Primary School Principal, Heath Chittenden. Students had to design an effective wall mount for the whiteboard duster that would be practical and of use for the classroom teacher. It was a functional task with the best design being used for this purpose. Level of Difficulty: Low/Moderate. Students had a 'free' design with this task as the success criteria was based around it working. There were many possible solutions to the problem that could incorporate additional features. Basic designs were a simple shelf with or without a lip, more advanced designs included holders for whiteboard markers. Issues: Some students didn't consider obvious issues such as the size of the tray to hold the white board maker. The holders for the whiteboard markers to sit vertically also tended to vary. There are different sized whiteboard markers. Some designs meant the eraser had to sit vertically in the holder which meant that picking it up was somewhat cumbersome. Details: This task was completed by Y7/8 students (11-12 year olds). Students sketched the original idea in a paper version (see example of diagram) converted the paper design to Tinkercad and then produced a 3D model. The form was then loaded through Cura and printed on an Ultimaker 2. Timeframe: The larger holders took fifteen hours to print although this was down to their size and the filling of the frame. The task was a homework task, the initial design was conceived with a minimum requirements for four sketches and one to be then developed and form the basis for the model. Process: Student design on paper including full measurements. Tinkercad to create 3D model then converted and printed using Cura. Problem Solving: Students need to consider size of the items being held or supported. A lip was required to stop the items on the shelf tipping off. Whiteboard marker holders needed to have correct width. The screw holes needed to be placed at either end of the 3D print to allow balance when mounted on the walls and had to have hole size that was realistic so it could be mounted. How can you contribute? : What could you students design and build in your classroom in addition to what is currently there? What extras could your students need to improve their environment? 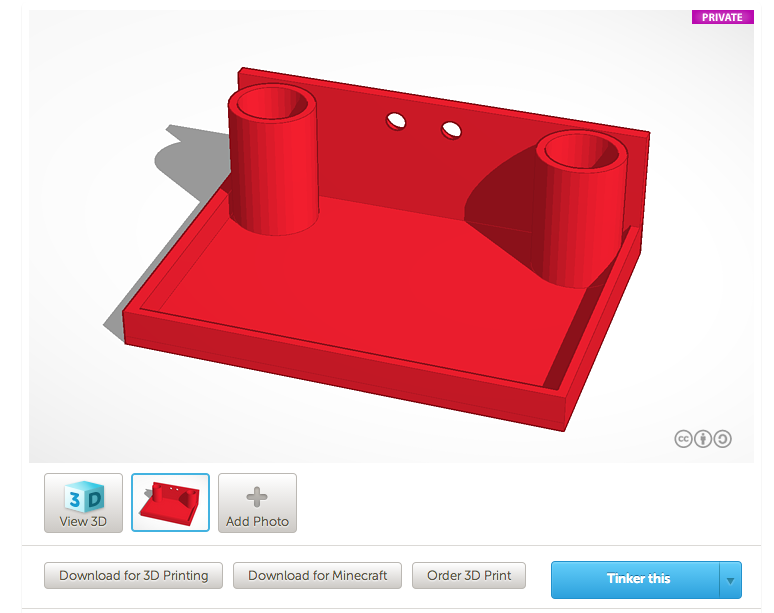 Learning Challenge: Create a replacement part for a working piece of machinery at home using a 3D Printer to create the piece. Background: The local Cricket Club, who have a close association with our school came to see us because they had a BBQ Knob that need replacement. Rather than replacing the entire BBQ they requested that we be able to manufacture a replacement part that would be functional and would allow them to continue using the BBQ without having to replace the entire BBQ. Task: We had the original part and were able to make an accurate copy of it as a result. The students had to make detailed measurements of the replacement piece. Level of Difficulty: Low/Moderate - as we had an original part we did not need to experiment with the measurements or the details. We simply used the existing measurements (so in this example the students did not carry out a written plan first, we were also on a restricted timetable). The replacement part, mounted on the BBQ next to the original piece. Issues: The students were able to complete this repair by the following day. The only issue came with the width of the internal gap to allow the knob to be connected to the BBQ. Students had to work out a way to identify the circumference of the internal gap and the depth of it. The gap also featured a sleeve which was metal as a heat protection feature. This sat inside knob. Timeframe: The students were able to complete the task following a sample print run. Using Tinkercad they were able to produce a prototype the same day. It had to be corrected to allow for the internal gap to connect it to the BBQ. Once one had been printed and the students realised that the gap needed to be adjusted they were successfully able to do so. The second print worked. Size: The finished product took approximately half an hour to print and measure 5cm by 5cm and had a depth of 5cm. Process: The students had an original piece on which to base their designs. This meant that instead of creating an original piece they were replicating a replacement piece. We are going to pay close attention to the longterm success of the part - currently there is no apparent damage to the 3D Printed part as a result of the cooking process however overtime we need to continue to monitor this. We could look at manufacturing the inner sleeve to protect it if required, however at this stage it does not appear to be an issue. The fact that this worked and the students were able to turn it around so quickly was a strong bonus. Problem Solving: Measurement - specifically in this instance the depth required from the internal part and the circumference of the internal circle. The concept seemed to be understood clearly by the students but the process involved proved a small stumbling block. While generic ones could be ordered online it allowed an opportunity to ensure we could design an individual piece that was tailor made for the BBQ. Have you used a 3D Printer to repair something at home? Have you designed or repaired something at home that needs replacing and can you send us the details so we can share and use your examples to encourage others? 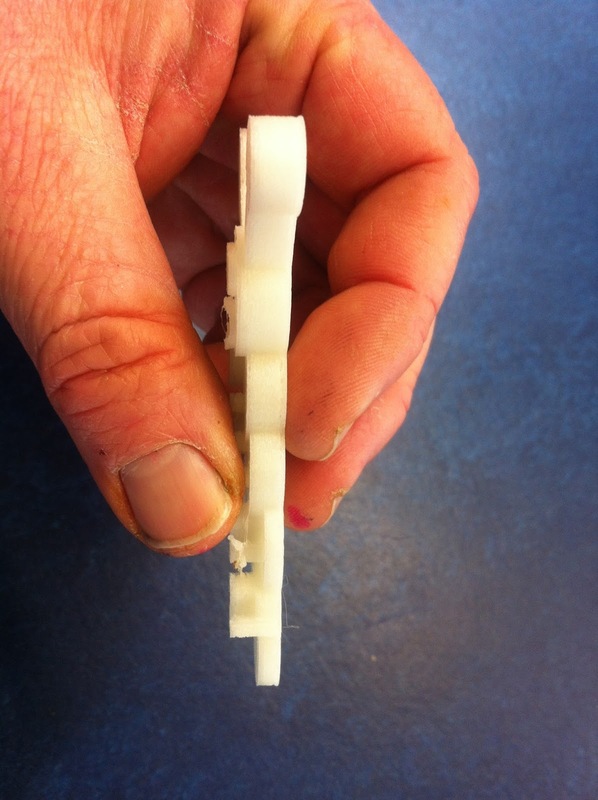 Repair part of the classroom and produce a working replacement part using a 3D Printer. Students brainstormed a part of the classroom that needed to be fixed or repaired. Students were briefed to look for something that fitted the size of the 3D Printer and could easily be replicated. A resource cupboard in the classroom had two latches, both of which had been broken and bent as a result of constant use. Students to solve problem depending on the state the classroom, the more modern the classroom the more challenging this would be. We also looked at hooks, holders and various resource creations. First time the printer was used. The mechanism in the original latch featured a spring mechanism to lock it, which couldn't be replicated. Students tried 5 or 6 regular versions of the print before one of the group came up with the 'ball and socket' approach. Students didn't consider attaching the latch to the door which caused them to increase the depth of the base of the latch. This was the original video created by students in my class that explained the process - please note the clip features a 3D Print from our original Printer, which has now been replaced by the Ultimaker 2. This task was completed by Y7-8 students (11-13 year olds). The initial designs were completed as sketches by one student, by hand, then refined using Tinkercad The school at this stage had a Diamond Mind 3D Printer. 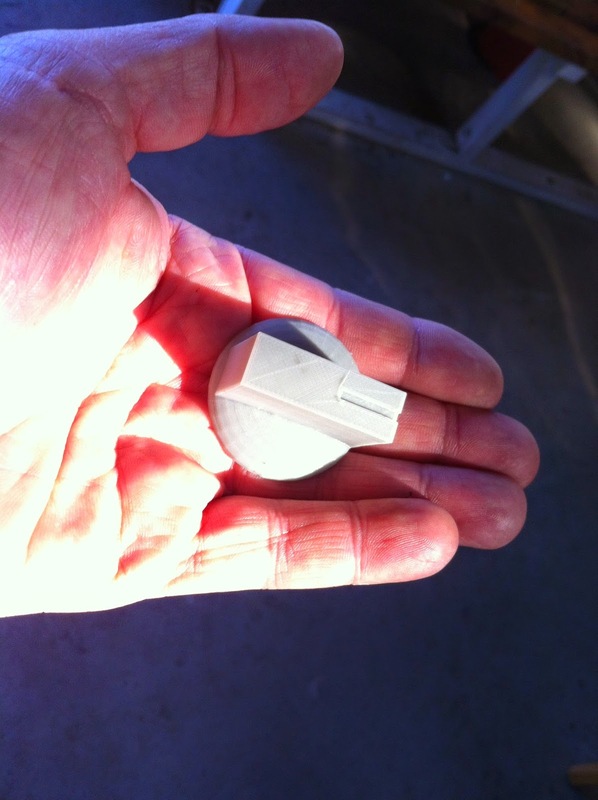 This caused delay with the print as it was our first time completing a 3D Print Project. The time frame was two months. The second go at this, with our Ultimaker 2 saw a time frame of under twenty minutes for the first print (from design). Students used Tinkercad for the first run with its pull and shape design. The design had already been determined by the initial prints - the students had realised quickly that they couldn't replicate the spring mechanism of the 3D Printer and so developed a ball and socket approach. This worked fantastically. Short: 20 minutes from design, print time in region of 20 minutes to half an hour. The finished print was approximately 7cm by 7cm with a depth of 5cm. Above: This Slideshow was created to explain the process to solve the cupboard problem - it shows the progression and the development of the designs - the original idea of the clips being replaced by the socket design. Identification of problem that needed to be resolved - in this case it was a broken part of the classroom that needed to be repaired. Students initial designs were reshaped during the process. Measurement. Extension: location and strength of the screw holes. Students also needed to determine the diameter and location of the screw holes. By using a ball and socket approach students needed to consider the depth, diameter and circumference of the latch that they were creating. When the latch was mounted there were issues related to the door. This slideshow was created by students from Auroa Primary School. The photographs that accompany it relate to the Diamond Mind Printer/Print. Our School no longer has this hardware and is now printing exclusively with Ultimaker 2. Have you used a 3D Printer to repair something in your classroom? Have you designed or repaired something in your classroom/school and can you send us the details so we can share and use your examples to encourage others?